I’ve been out today. I’m always out, as in not in, unfashionable and living under a rock. I actually physically ventured out today though. I never go out willingly, only under the threat of force and/or starvation. I don’t assume I’d even notice if I were put under house arrest, and if I noticed, I’d likely be delighted. A shutdown pub whose windows alternated stickers Just open and Closed down. 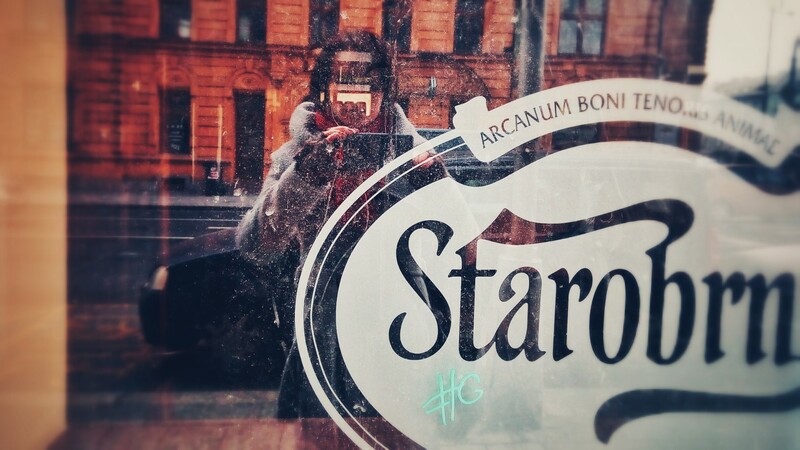 I shot my reflection in one of the windows, hence the featured image of this post. A ten-year-old male kid smoking an electronic cigarette. What a dumbass, if you excuse me (and even if you don’t, I’m afraid I must insist). A mother pushing a pram of poisonous green colour and wearing yoga trousers of the same poisonous green. Unfortunately, the trousers were a size smaller than the woman and her baby was too young to tell her that she doesn’t quite rock the outfit. Two black cats, which ran away, frightened out of their fur, when I approached them waving my arms hysterically and crying awwweeee. I don’t blame them. A hole punched in the door of a psychiatric clinic. I don’t blame the patients either. I was tempted to re-punch the door in the hole as I was waiting for my appointment. What a dumbass … it will probably halt his growth — that’s what they used to tell me when I was a kid. About the yoga pants … it’s a common sight here, and you know about the obesity problem in North America … go figure. I just don’t understand WHY one would want to wear them, when you’re that big, but … it’s their thing I guess *shrug*. I’m delighted that we’re in agreement. As a smoker, I know too well what a dumb habit it is. Don’t get me going about yoga trousers – I wear nothing else at home, but I have sense enough not to wear it in public… It is surely everyone’s business but I like it when people are considerate of other people… I know, I’m mean. I’m a smoker too. We’re a threatened species here. Well, I may not be overweight (yet), but I don’t think I have the figure and age to pull off yoga trousers – like you, I only wear these when I take out the rubbish, literally sneaking and hoping that I won’t meet anyone on the way. Haha, yes, I think we all do that, envisioning people whom we never saw! Incidentally, I do envision you as small and thin too. Curious! P.S. I’m average height and average weight, though in my mid-20s, my weight was slightly below 50kg. I did look somewhat malnourished. I had done that once, with another blogger … envisioned. Finally I got to see a photo of her, and my picture was spot on! Even her features, it was almost eerie 😊. I’m rather tall, 171 cm, average weight, even though I wouldn’t mind losing, say … 5, 10 kilos. That’s totally eerie! Well, I wouldn’t mind losing 15 kilos to get back to my fifty. But I think that’s really to much to ask. People no more think that I’m anorectic, except they now think I’m pregnant. LOL Yeah, like we mentioned before … moderation doesn’t seem to be any great vice of ours. Haha 🙂 Moderation is for sure a vice.